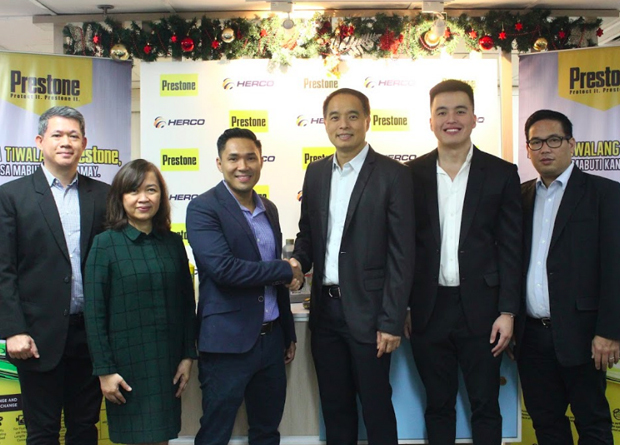 Prestone partnered with Herco Trading, one of the largest and most established retail distribution companies for hardware and auto care products in the Philippines, in a bid to make its car fluids and engine oils more available to auto mechanics and car owners. Linus Cañamo, National Sales Manager of Clorox Philippines; Marites Dagdag, General Manager of Clorox Philippines for Southeast Asia; Paulo Lao, Sales and Marketing Director of Clorox Philippines for Southeast Asia; Wilfred T. Co, President and CEO of Herco Trading Inc; Wayne Y. Coherco, Vice President and COO of Herco Trading Inc.; and Ian Jasper Toralba, Head of Sales, Branded Products of Herco Trading Inc. Through the partnership, Prestone can leverage on Herco’s nationwide market coverage, as well as its distribution competency, making their products accessible to more consumers. “The best service centers, auto mechanics, car enthusiasts and owners trust Prestone products for that safe, worry-free driving and engine protection that keep their cars running smoothly. They won’t take a chance on any less respected brand. With Herco’s distribution network, Prestone is able to expand reach to more consumers looking for high-quality car care products,” said Paulo Lao, sales and marketing director of Clorox Philippines. “Through this partnership, we hope to further advocate safety for car owners, drivers, and passengers since we believe that a protected and well-running vehicle will allow them to go wherever their passions may lead them,” Lao said.